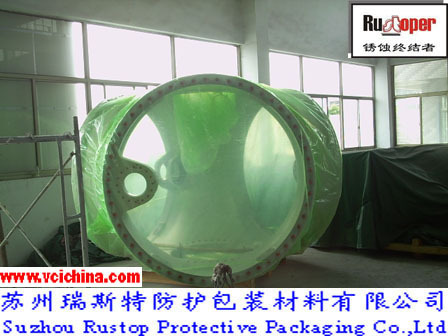 Rustoper (corrosion terminator) VCI Bag is made by high-quality VCI films as basic materials. VCI plastic bag is the new generation of creative hi-tech products based on the combination of the high polymer material and VCI antirust technology. After the bag is used to pack and seal the articles for antirust, VCI contained in the bag begins to sublimate and volatilize the antirust gas factors which diffuse and penetrate into the surfaces of the articles for antirust and adhere on them to form a compact protection bag with the thickness of monomolecular to avoid the surfaces of the articles for antirust in contact with all factors inducing corrosion, thus the corrosion is effectively prevented. 1 The bag performs excellent gas phase and contact antirust function, with good antirust effects and high cost performance. 2 The bag is clean, harmless and non-toxic, so it is safe to environment. It passes SGS certification and meets RoHS directives.